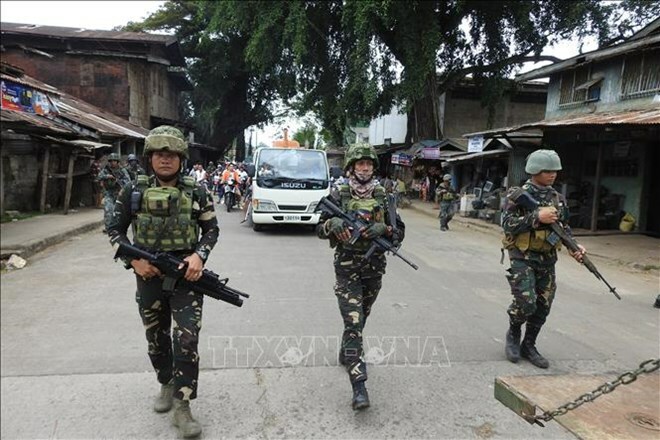 Hanoi (VNA) – Security forces of the Philippines are intensifying their operation targeting militants with IS links who returned from the Middle East, said Defence Secretary Delfin Lorenzana on March 19. The secretary said many foreign gunmen who joined the IS are fleeing and returning to their own countries after the IS lost its territories in Syria and Iraq. Therefore, if there are Filipinos fighting there in Syria, then they might come to the Philippines, he said. Besides, experts said many IS core elements have decided to leave the Middle East after losing their major strongholds in Syria and Iraq. The militants have reportedly targeted the Philippines as in their plan to build an IS caliphate in Southeast Asia. In such circumstance, the Philippines is enhancing its cooperation with Malaysia and Indonesia to prevent the militants from crossing borders. A high-ranking officer of the Philippine military said there are about 40 to 100 foreign terrorists embedded in local terrorist groups in the Philippines. Last week, Maj. Gen. Cirilito Sobejana, commander of the Philippine Army's 6th Infantry Division based in Mindanao, claimed that the military troops killed a foreign terrorist in Shariff Saydona Mustapha town in Maguindanao.